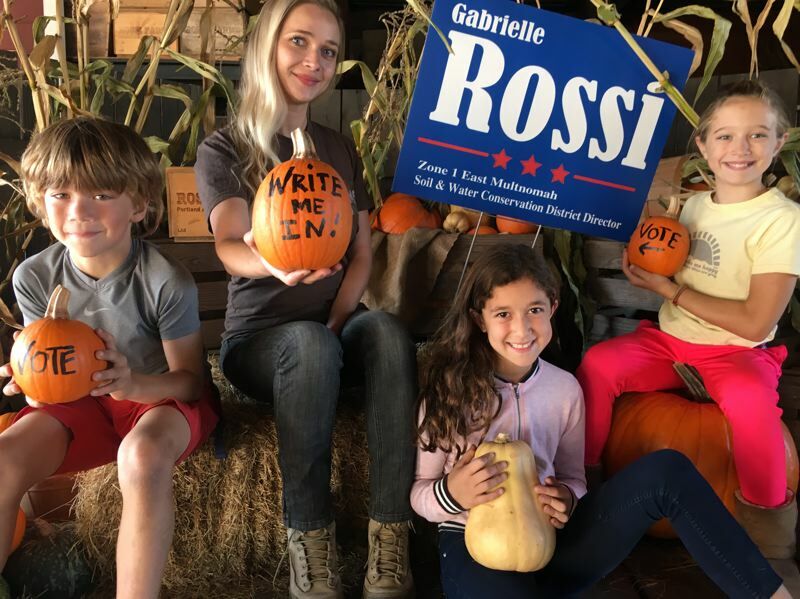 Gabrielle Rossi, 29, appears to have won the write-in campaign for a vacancy on the East Multnomah Soil and Water Conservation District. With no candidate on the ballot, the race for Zone 1 — a large swathe of land north of SE Stark Street and east of the Willamette River—had captured the imagination of county residents, many of whom urged friends and family to write their names in. However, under state law, the only candidates who are able to take office in such a district have either served as a volunteer in one, or been pre-certified as managing or controlling a certain amount of land within the conservation district or the zone they are running for. Of the two candidates certified for the race, Paula Gagnon and Paula Rossi, Rossi by far drew the majority of votes counted in an unofficial tally on Nov. 20. Rossi is a fifth-generation farmer whose family has run Rossi Farms in Parkrose since 1880. She said she is shocked and overwhelmed by her victory. As far as her plans on the district board, she said she has been devoted to sustainable agriculture and continuing her family's farming heritage since she first drove a tractor at age 7. "I want to maintain an open mind to what the community wants as well as imparting historical and generational knowledge from our area around us," she said. According to the unofficial preliminary tally, Rossi drew 2,886 votes as compared to 1,434 for Paula Gagnon, a farmer and conservation consultant. In comparison, at least 36, 751 people cast votes, meaning the vast majority of votes cast were for non-certified candidates and were not counted. Tim Scott, county elections director, stressed that the count was not final, with some remaining ballots left to be counted. The county, he said, only counts the votes cast for candidates who have been certified by the state Department of Agriculture. Rossi's family printed up 15 campaign signs that were shared with about 10 neighbors. She, her family and friends also reached out to friends and contacts by text and on social media. "My dad and I had a bet between each other, I guessed I would have received 120 votes and my dad said 160," she said. The unusual restrictions go back to the history of soil and water districts. They were set up by a federal statute to conserve soil, water and private farmland after the Dust Bowl crisis of the 1930s, when drought combined with poor farming practices wrought economic devastation on families in the Great Plains area of the United States. Rachelle Dixon, another candidate who had sought the seat, mounting a vigorous campaign, watched the votes get counted on Tuesday, as did Rossi. Dixon, an urban gardener focused on climate change and equity, had been disqualified because she'd not met the state's mininum of 10 acres with the zone she was running for. Prior to the election, Dixon told the Portland Tribune the system of pre-qualifying candidates for conservation districts seemed opaque, archaic and anti-democratic. And on Tuesday she expressed dismay that her votes were not tallied. "I would like to know the count," she said in a text.